Karen’s apple cake recipe makes a wonderfully warming sweet treat, with the heady spicing mingling with chunks of sweet apple. This cake can be served cold as part of an afternoon tea, or is equally good warmed up with lashings of cream, ice cream or custard for dessert. Apple cake, one of my favourite cakes and one that often finds its way onto my tea time table . . . it’s also a type of cake that makes a great ‘pudding cake’ when heated and served with cream or hot custard, or even a scoop of ice cream. 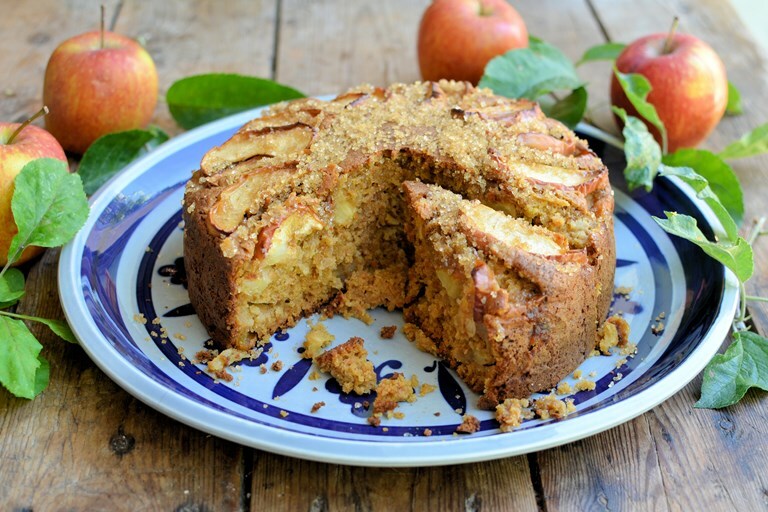 I make all manner of apple cakes, from apple tray bakes to apple sponge puddings, but today’s recipe for Spiced brown sugar apple cake is probably the one we all love the best – with its spiced, moist toffee crumb and chunks of juicy apples. It’s also a very easy cake to make, being an all-in-one cake mix, which is always a winner for busy bakers! You can use any eating apples that are in season, or any that you have to hand, but my favourites are Cox’s Orange Pippins and Braeburn apples for flavour. Serve this for Sunday afternoon tea along with freshly cut sandwiches and a pot of tea, and maybe a jug of thick cream too, it’s bound to please all the family. This cake also freezes beautifully – you just freeze slices wrapped in greaseproof paper and cling film. 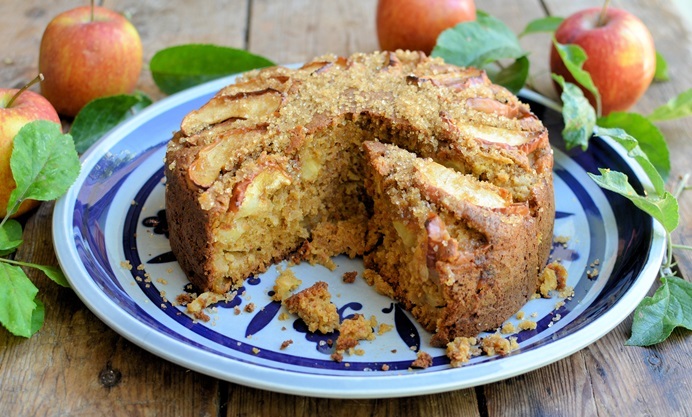 Also perfect for lunch box snacks and picnics, this is the ultimate apple cake, in my opinion!